Detailed Tracking Data: Expires. The data for specific contacts about emails they were sent and actions that were performed (sends, clicks, opens) is kept for a limited amount of time due to the huge volume and relative shelf life of this data. Aggregate Tracking Data: Is Retained. Totals and statistics calculated from the detailed tracking data for every delivery is kept indefinitely for all messages. By default, detailed tracking data for email deliveries are tracked and maintained in Bronto for 90 days. Depending on your account type, you can purchase an extended Data Retention Period of 1, 2, or 3 years in order to retain this data for a longer period of time. After data expires it is not available for review or use within Bronto. However, you can still view the aggregate information based on the expired data so you can use these statistics to recognize trends that can help you better target your marketing campaigns. If you want to maintain detailed tracking data indefinitely you can save this data outside of Bronto by exporting and saving it. For more information, see Archive Data Affected By The Data Retention Policy. 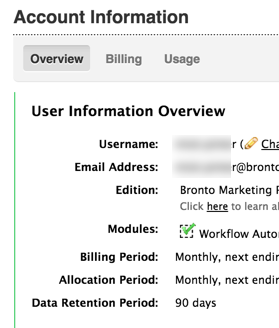 The Data Retention Period for your account can be viewed by clicking the Account Info link in Bronto. If you are interested in extending your Data Retention Period contact your Account Manager to see if you are eligible. Carts Expires Cart data, including line item information, will be deleted from Bronto 90 days after the cart creation date. Cart statistics used to generate metrics will be saved indefinitely. Consent Records Retained Retained for the lifetime of your Bronto account. Contact History Expires This is the information on the History tab of the Contact Details page. Contacts and their field data Retained When you delete a contact, they are no longer visible in your account and will not receive any of your emails. A contact's data is typically deleted within 24 hours but it could take up to 15 days to fully remove all related data. Once deleted, contact data cannot be restored. Segments Retained Segment data is retained but some data segments may use does expire. The length of time we will keep contact-level sent, opened, clicked, and/or conversion click metrics are subject to your account's data retention policy at the time a segment is created. If a segment is built based on one of these metrics that are past the Data Retention Period, then the segment data may be inaccurate or not return results. Online version of previously sent email messages Expires This is the web version of an email that contacts can view by clicking the "Have trouble viewing this?" link. Once the data retention policy has passed, this link will no longer work in old emails. Link Tracking Expires While link tracking data expires, the links contained in your sent emails continue to work for the life of your account. The record of deliveries is maintained, but detailed information about deliveries that is subject to the Data Retention Policy will not be shown when you view a delivery or delivery report after the data expires. This includes detailed information about sends, clicks, and opens. Therefore, the name of any list, segment, or keyword that a delivery was sent to, or that was excluded from the send, is not displayed for deliveries past the Data Retention Period. Instead you may see the word Unavailable. Delivery Metrics Retained This includes things like the number of opens, the average clicks, and the conversion rate. It does not include contact-level details about these actions. Email Replies Expires This does not apply to any email address that replies were forwarded to outside of Bronto. Automated Message Rules Retained Automated message rules may not be built based on contact-level sent/opened/clicked/converted data that has expired. AMR report data is subject to the Data Retention Policy for reports. Workflows Retained Workflow report data is subject to the Data Retention Policy for reports. Contact-level details about sends, opens, clicks, and conversions expire. Aggregate and summary reporting data is retained. User-generated reports and consent export reports expire after 90 days regardless of an account's Data Retention Period. Note: Reports based on contact-level sent/opened/clicked/converted data older than the Data Retention Period will not display any data. Deliveries: hour-level data is only available for the first two weeks after the delivery is sent. When you view a report for a delivery that was sent more than two weeks ago, and select a data range that would display hour-level metrics within the first 2 weeks, data will be unavailable. Messages, Lists, Segments: the most recent two weeks of hourly-level data will always be available for querying. When you view a report for any of these objects and select a date range that would display hour-level metrics in charts outside of the most recent 2-weeks, data will be unavailable. Note: Hour-level data is the default view in charts for a 3-day period or less. Any date filter that is greater than 3 days results in charts defaulting to day-level data. Browse Events Expires Browse event data is available for storage to Browse Recovery and Recommendations Premium app users. Browse Recovery: Stores the last 30 days of browse data. This data is used to evaluate Browse Recovery rules in order to trigger email messages. You can export data affected by the data retention policy from Bronto in order to permanently archive it outside of Bronto.